The Center runs a choice food pantry where people come in and choose the food items they want, Cornwell said. 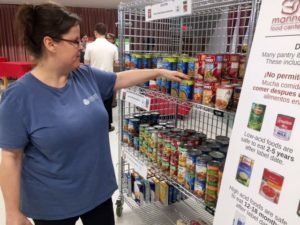 The model of a choice food pantry, she said, gives people more dignity and helps eliminate food waste since people choose the foods they want, rather than what is simply given to them. It’s also a more hands-on form of ministry, Cornwell said, because volunteers are needed to walk through the pantry with every guest, talking and building relationships along the way.